We start losing our hair fairly early. If this is happening to you, you need to make this drink immediately. Endocrine disrupting chemicals (EDCs) are found everywhere, from the soaps we put on our body to the water we drink. They’ve been shown to interfere with the proper function of our endocrine system, in some cases they mimicking hormones, and in other cases blocking them. This hormone controls the level of sugar in the blood and cells, and too much can cause the cells of our body to develop resistance, leading to a sluggish metabolism, and imbalances of all the other important hormones we mentioned. Because insulin is one of the body’s “major” hormones, it becomes almost impossible for the body to manage all other hormones when insulin goes rouge. Cortisol aka the stress hormone. This hormone causes havoc when there’s too much, as well as too little. Over production leads to blood sugar elevation, causing weight gain, fatigue, and in some cases, fatty liver disease. A lack of cortisol develops from long-term stress and is associated with exhaustion, cravings, weakened immune system, and intolerance to exercise, just to name a few. While changing diet and lifestyle is a given when trying to reduce your toxic burden, there is one simple drink you can make each day to help kick start the process. The herb is called Stinging Nettle, or in it’s Latin binomial, Urtica dioica. It’s also a rich source of minerals like zinc, magnesium, potassium, and iron, which means a long steeping process is necessary to pull out all the good stuff. Consume 1 L of infusion throughout the day. You can reheat it and mix with some almond milk for a latte like infusion, or drink it with a touch of honey for a refreshing cold beverage. Added Tip: I usually recommend making 2-3 days worth at one time, remembering the ratio to of 1/2 cup leaves to 1 L of water. Store the leftover infusion in the fridge for up to 3 days. It’ll save you some effort in the long run. Note: you should not drink this tea if you’re pregnant, as it has been shown to stimulate uterine contractions. 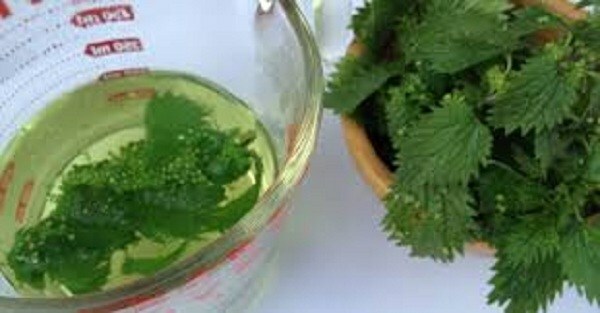 However, if you’re having a hard time dropping milk to breastfed, drink up, as stinging nettle also promotes lactation.